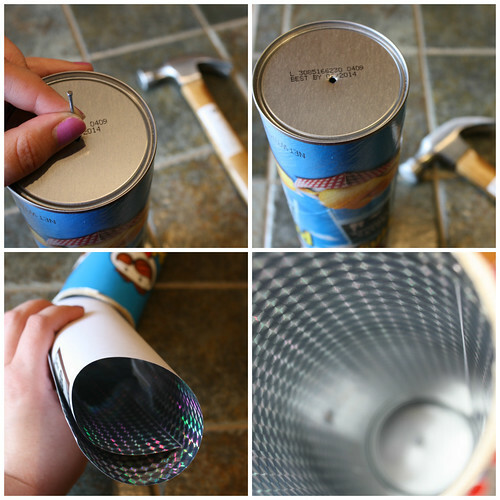 I have been tossing around the idea of making something with a pringles can for a while. It seems like a fun place to store treasures, but I thought it might also make a cool toy. I was very excited to find a project idea online for a kaleidoscope made from a pringles can, but I wanted to put my own spin on it. 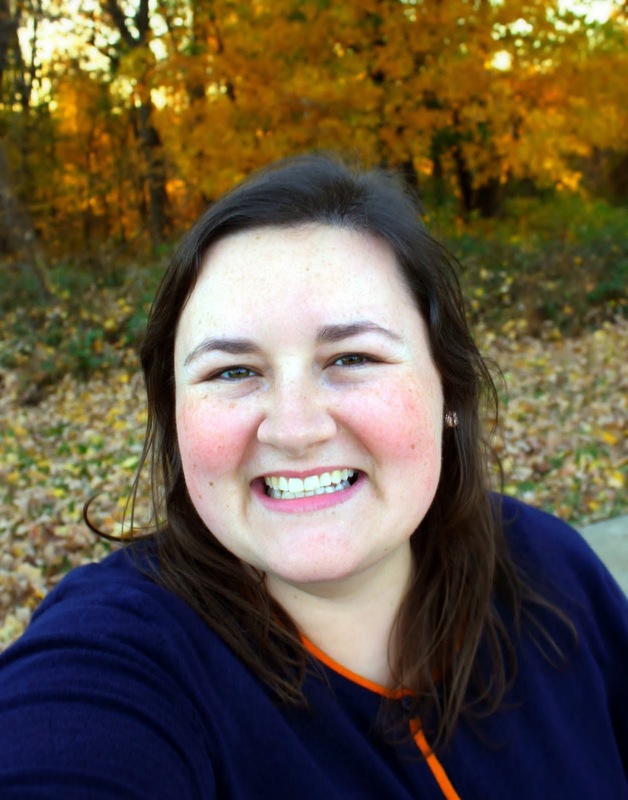 My project steps are below. Enjoy! Be sure to wash your Pringles can first thing. Let it dry, and then you can work on your kaleidoscope. Nail a hole through the bottom (metal) part of the can. This is the part you will look through when your scope is finished. Turn the can over to the other side. 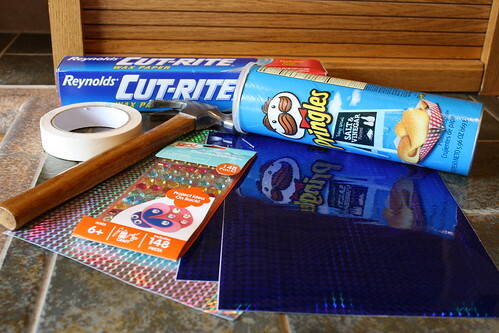 Use the silver holographic paper (I found this for 50 cents in the scrapbook paper section of the craft store) to cover the inside of the can. Tape it in place, with the edge lined up to the open part of the can. Now that the inside is covered, you can cover the outside of the can. This holographic paper had a sticky side, so I peeled the back off and secured it to the outside of the can. I did not do that on the inside, because it would be too difficult to smooth out the sticky part. Tape is enough to secure the paper on the inside. Once the outside is coated, you are ready to work with the gems. Glue/stick the gems to the inside of the lid. 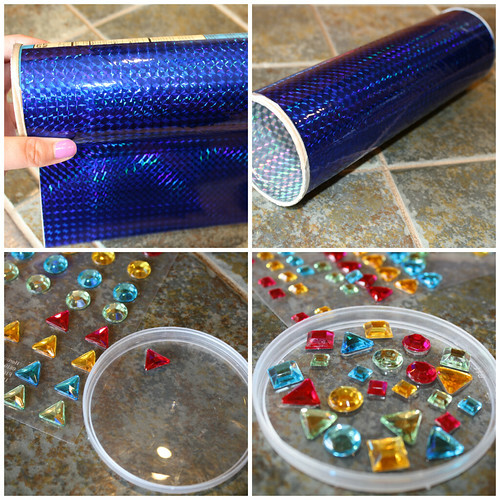 You can also add some gems to the end of the can where the lid will go. Cut out a circle of the wax paper and tape it to the outside of the lid. 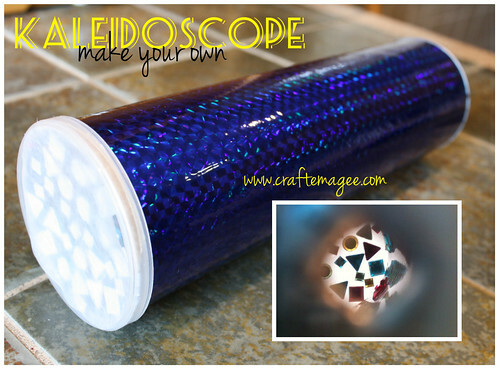 Place the lid back on the can, and your kaleidoscope is finished! 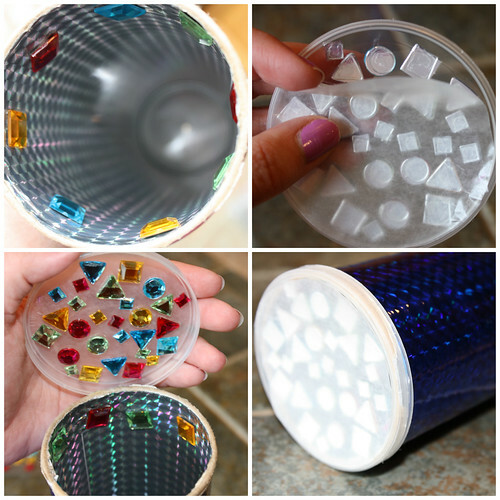 By looking through the kaleidoscope while facing light and turning the lid, you will see the gems reflecting off the holographic paper inside the can. This creates a kaleidoscope effect. 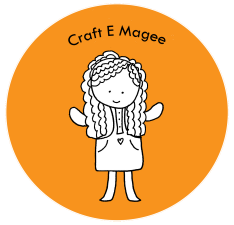 I hope you've enjoyed this craft--another great project to do with kids this Summer! Mini Pies for the Kentucky Derby!